Apple better watch out! That’s because OnePlus is slowly becoming one formidable competitor that may very well one day take on the giant in the smartphone space. 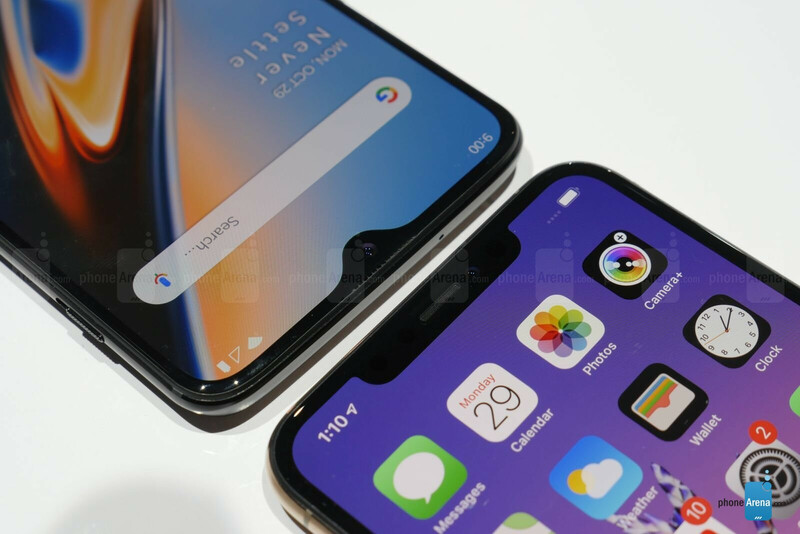 Apple unleashed its latest iPhones not too long ago, the iPhone XS and XS Max, to the delight of many having proven their worth in nearly every capacity. Well, the OnePlus 6T is looking to rattle things for the Cupertino-based company, seeing that it’s innovative in its own unique way. 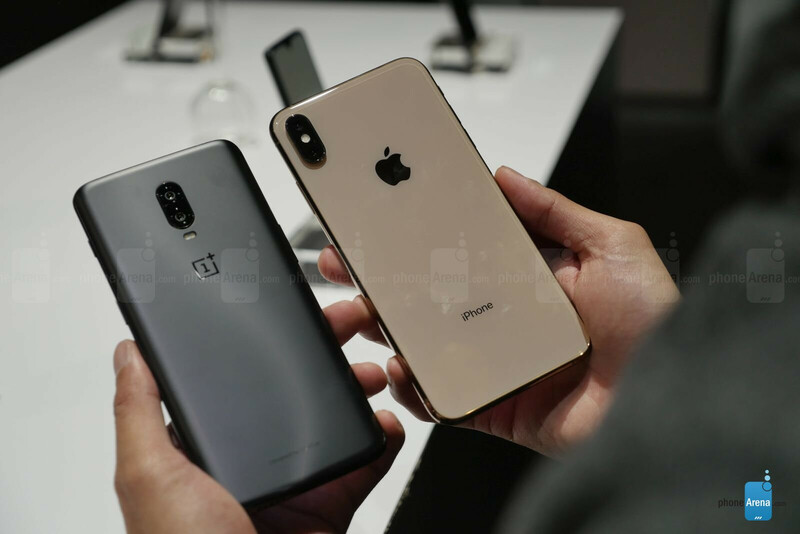 Spending just a short time with the OnePlus 6T and Apple iPhone XS Max, it’s going to be interesting to see how much of a dent the OnePlus 6T can make into Apple’s unrelenting grasp. Responsiveness, it’s arguably one of the most notable commonalities that the two phones share with one another. Apple’s iPhones have always proven to be the most responsive in the industry, including its latest offering in the iPhone XS Max, which leverages the company’s new A12 Bionic chip. In contrast, there have been few that can match its insane level of snappiness, but the we can certainly attest that the OnePlus 6T gives it a good run for its money – an impressive feat for a Snapdragon 845 powered device, so you know that the software and optimizations certainly have a hand in all of that! Next up, we can’t help but look at the difference with the notches on their respective displays! 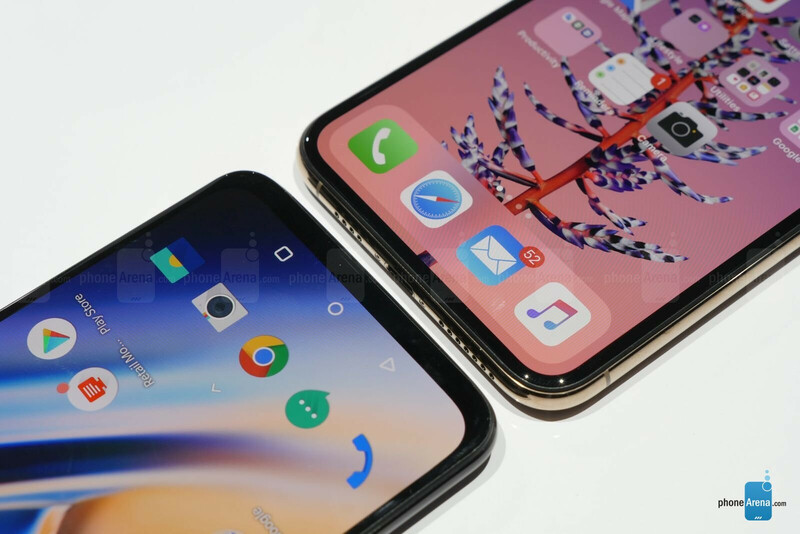 The iPhone XS Max has that notorious, hard-to-miss notch that covers a wide gap towards the top of the display – whereas the OnePlus 6T has a very subtle “teardrop” shaped one. It’s night and day essentially with them, but the reasoning behind that is seen in how the two phones differentiate with their security. 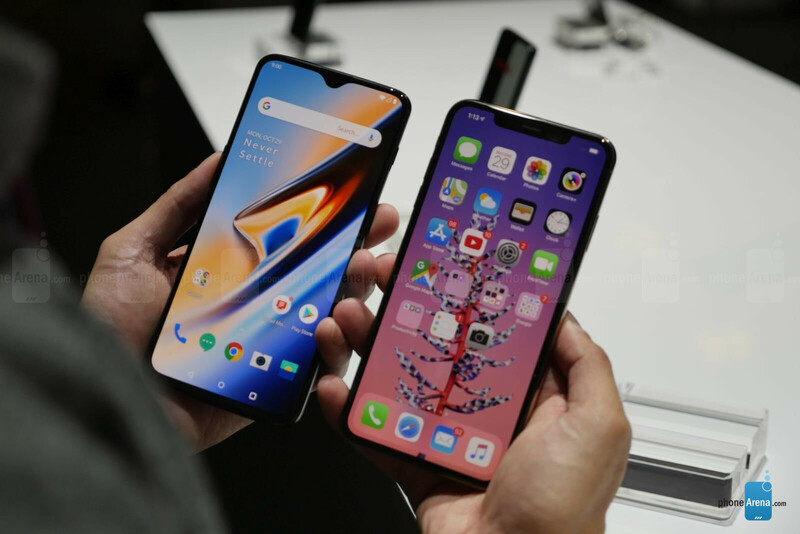 With the OnePlus 6T, it employs a fancy new in-screen fingerprint sensor, while the iPhone XS Max features an array of tech for its Face ID. Technically, the facial unlock option is still there for the OnePlus 6T, but it doesn’t utilize the same kind of accurate and precise technology that’s powering the iPhone XS Max’s Face ID feature. We’ll give the OnePlus 6T the credit for now with its in-screen fingerprint sensor, but we really hope it’s just as reliable as Face ID. Another disparity between the two is seen with the design of both phones. Yes, they both offer that glass meets metal construction, but the iPhone XS Max is significantly heavier in the hand, which does make it feel a bit more substantial in the process, but the OnePlus 6T certainly feels like it’s more manageable to handle. We’re especially in love with the midnight black edition of the OnePlus 6T, since it seems to do a great job at masking fingerprints and smudges. The silver version of the iPhone XS Max does equally well with that, but it’s worth noting that Apple’s offering has an advantage in the form of its IP68 water resistant construction! For some, this is definitely useful! OnePlus really did hype up the new nightscape mode with the OnePlus 6T, which leverages HDR and optimization processes to enhance its performance under low light situations. By now, there's no denying that the dual-camera system of the iPhone XS Max is a pleasure to use because it’s well-rounded in producing phenomenal shots – in just about any condition too! Furthermore, it’s proven to be a champ already when it comes to nighttime photography, so we’re eager to find out in nightscape mode can be equally captivating with its performance on the OnePlus 6T. And lastly, there’s the matter of price. Right away, the advantage seemingly goes to the OnePlus 6T for its super aggressive starting cost of $549, which makes the iPhone XS Max seem bloated at $1100 for the base 64GB model. The base storage option for the OnePlus 6T is the same, but it’s mind blowing to know that you’re still forking over double the price to pick up Apple’s larger iPhone. Naturally, there are certain expectations given to the higher priced smartphone – like it producing better looking photos, longer battery life, and much more. However, if the OnePlus 6T proves that it’s able to bridge the gap closely in all those key areas, Apple will definitely need to take OnePlus seriously. iOS vs Android = Mac OS vs Windows. Android & Windows any day. Goodluck with ads and insecure platform. Ads are no issue since long ago, ever heard of adway or blokada or ...or .. the list never ends. Insecure platform?.....give me a platform that is 100%secure; that is a myth..... as long you are surfing the net nothing is secure with that in mind you have nothing to worry about. So in my books i know how to use my device to make it secure enough. Android has nothing to do with Windows. Android is just a decent Linux. screen fingerprint sensor, but we really hope it’s just as reliable as Face ID." Face ID is just hit or miss.. Its not a reliable way to unlock iPA. I disagree. My Face ID unlocks my device instantly and everytime. It's exactly what "many reviewers" were saying about fp scanners then, after they were in any relevant device, they suddenly changed their mind and started to praise them. FPscanner evolved several times since then, while FaceID didn't get any hardware change since last year (if they did, they'll say that in their keynote). I have been using 5s for 3 years as a daily device (I bought it in the first year it was released), I switched to 7, I have used quite a few Android device with fp scanners and I can say there's nothing wrong with the way it works - except the speed (which is not really an issue) and maybe 1 out of 10 fails VS 1 out of 20 (I use empiric numbers). Also, all this time I haven't heard of problems with 5s fp scanner system, except those so called problems in the beginning, which suddenly dissappeared after a year. Hey you, I just read those reviews and all of them say postiitv things. One guy complained that it doesn’t work with fake beard, the other says he couldn’t trick it with a photo. One said he even tested it on twins and it worked with one but not the other (even family couldn’t tell them apart) read it! Most of them say it’s fast and reliable. Only the title says it’s not. Additionally this is an intitial review with a test device given to them. Furthermore, unlike you I don’t need reviews - I own this device, I use Face ID 50 times a day - and it’s damn reliable. Is that’s the worst you were able to dig up? I encourage everyone to read it - he google for catch phrases - which is in the title - but read actual reviews - they praise Face ID. You have never used an iPhone with FaceID, poor soul. Phonearena ....you better fix this. One plus 6t comes with 128gb not 64gb for the base model.. And lastly, there’s the matter of price. Right away, the advantage seemingly goes to the OnePlus 6T for its super aggressive starting cost of $549, which makes the iPhone XS Max seem bloated at $1100 for the base 64GB model. The base storage option for the OnePlus 6T is the same. As my Nexus 6P starts its journey into the sunset, I tried the iPhone Xs Max as a possible replacement. The phone feels great in your hand. It's a solid phone that looks fantastic just like the article says and it takes REALLY nice pictures too. I also got the OnePlus 6 and when making a final decision, I went with the OP6. As a longtime Android user, I was on the fence about getting an iPhone due to how much I dislike the Pixel 3 XL (the Pixel 3 is too small). I gave the iPhone a shot but in the end, paying twice as much just wasn't worth it for what I wanted in a phone. Just like the reviewer experienced with the 6T, using both the Xs Max and OP6 the difference in app performance was negligible and certainly not worth spending double the cost. I'm not a big photo buff so the camera quality was not an issue for me personally. I still have a need for a headphone jack but I may not have that choice in a few years so for now, I want one. The UI for Android is still better imo...I like, no, I NEED a back button. It's too ingrained in how I use my phone. I'm trying the gesture thing on the OP6 but it's just not intuitive yet. There's also the integration with other products. I have a Google Home, a Chromebook and a Pebble watch. These things just work better on an Android device and on top of spending double for a phone, it's not worth it to pay even more for other Apple products. I could never get my Pebble watchfaces to sync like I could on the OP6. FaceID worked really well for me on the iPhone but I prefer having the FP sensor. My preference is having it on the back so I'm hesitant to get the 6T. It's nice to hear that it works so well but I've read that the screen gets brighter to better read your finger which would be an issue in the dark. My guess is that when the software improvements on the 6T make their way to the 6, I won't have to worry about upgrading until maybe the 7T or OP8.